Ouch! Okay, okay, I apologize! Yes, I pun. Badly. But I cook pretty well, on the whole. 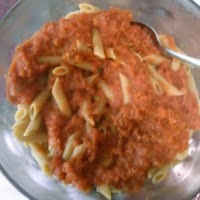 Last night, we had whole wheat penne rigate with homemade sauce -- kinda sorta. I'm not sure it counts as homemade if you start with a can of diced tomatoes, as I did. Combine all ingredients except cheese in a saucepan and simmer, stirring frequently and adding water to keep it from scorching, until tomatoes are soft. Mash the soft tomatoes and continue to simmer until the sauce is kind of thick. Add cheese and stir to melt, or wait and sprinkle over the dish at the end. Meanwhile, cook the pasta according to package directions. Drain and put into a bowl. Top with sauce. Another #Vegan Feast. YES, ANOTHER ONE!